I was born in 1970 in Chetris, USSR. When I was 12 years old I was admitted to art school in Chisinau. There I studied painting, drawing and composition. In 1989 I was admitted to the decorative arts department of the Art Institute in Chisinau. 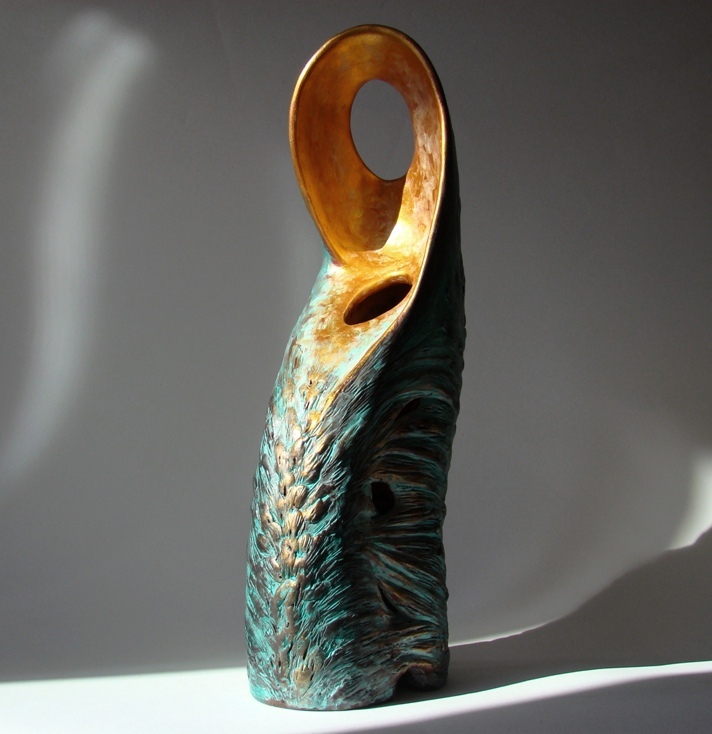 From 1990 – 1995 I studied at the Visual Art Institute Ioan Andreescu, Cluj-Napoca, Romania, followed by continuing studies and a Masters degree in ceramic art. From 1997-2001 I collaborated with porcelain factories as a model maker. In 2001 I became the European director of the Royal Crystal Collection USA and administrator at Diocristal until 2008. I was a founding member of the artists groups Arc Group and Atelier Plus; I exhibit with them in group and solo exhibitions, at home and abroad. I also lecture at Christian events. I am married and have three children. In painting I use oil and acrylics and for sculpture and ceramic I use refractory materials and clay. The style is a kind of modern figurative symbolism. Themes are preponderantly from Christian culture and tradition. I try to expess my personal experiences and my concept of world and life in a visual language. My great challenge is to be relevant in a world of relativism and to keep growing artistically and spiritually. My faith intensely affects my work, as all my work is a fruit of my personal beliefs as a Christian. 1. 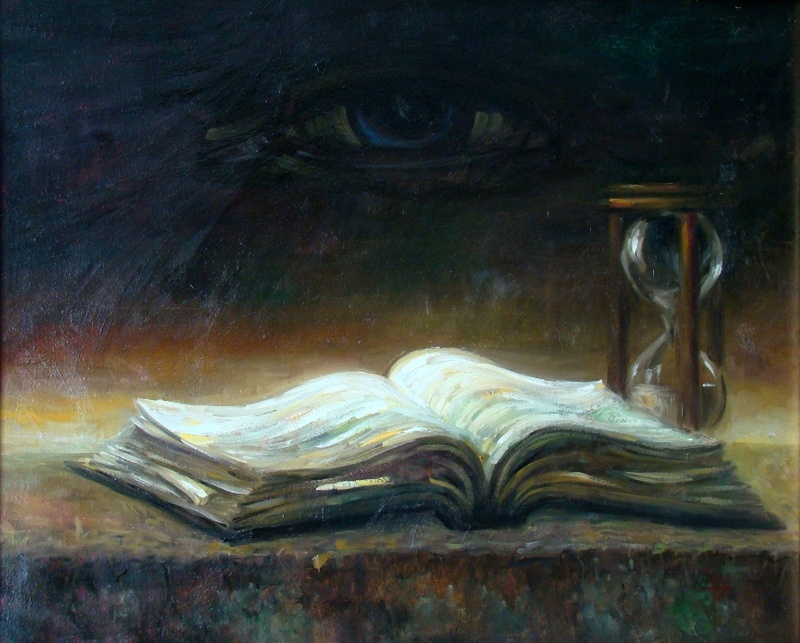 Book and Time, oil on canvas, 60 x 50 cm. This painting is a meditation about what is fundamental to our existence. The open book on the stone seems to metamorphose in waves. Besides it time silently slips away through the sandglass. All happens under the eye wich contains it all and at the same time is outside of them. 2. The Crown, oil on canvas, 165 x 165 cm. This painting was intended for an Easter exibition for a cultural urban hall in Cluj-Napoca city, Romania. 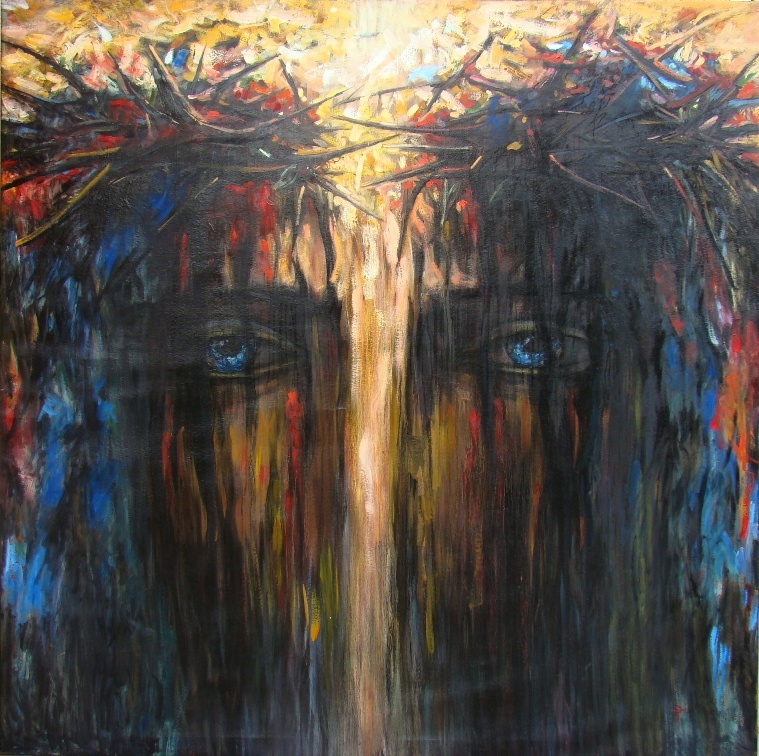 It represents the Man of Sorrow (Isaiah 53) with the crown of thorns. The crown stands for our sins and diseases wich he wore for us, so by his wounds we are healed. I used deep dark colours which emphasize the oppression. By contrast the upper zone is painted in light and warm colours as it opens ”a way” and at the same time is like an overflow of grace. The eyes’ gaze is not an accusing one. The work is about the power of redemptive sorrow. 3. 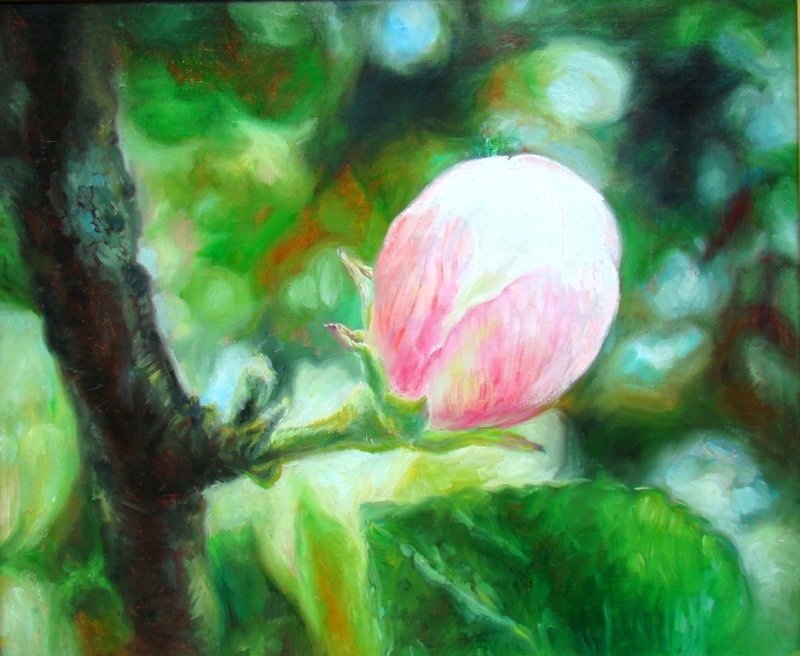 Flower Bud, oil on canvas, 60 x 50 cm. This work suggest renaissance in analogy to the resurection. In one symbol we see the beauty, fragility, vulnerability and the power of the next fruit. 4. 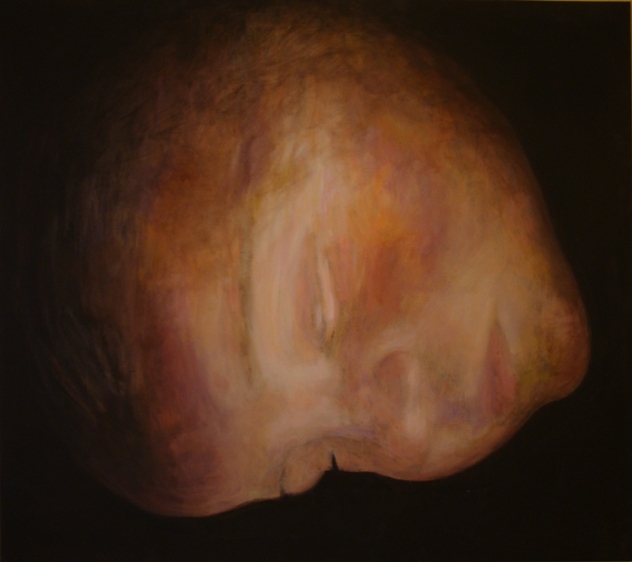 The Cosmic Child, oil on canvas, 130 x 115 cm. This work was made for a Christmas exibition named Child. The Child’s head looks like a universe, while its face line joins the sky and the earth. The Child is contemplating the place where he is going to be born. 5. The Prodigal Son, painted ceramic, 35 x 10 cm. This work is a modern interpretation of Rembrandt van Rijn’s painting with the same title. It is a stylized ceramic mould in which can be distinguished the figures of the father and son bonded together. The father’s head is suggested by an oval hole, so that through the father’s head penetrates light towards the son. 6. 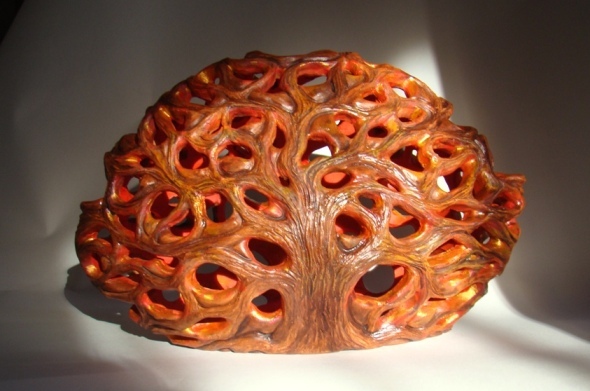 Illuminated Tree, painted ceramic, 25 x 18 cm. By putting a light inside you get a symbol for fiery prayer and the Holy Spirit.